Yasemin Tomakan was born in Beverly Hills, CA and was raised in Istanbul, Turkey and New York City. She attended the Art Students League in Manhattan and is a graduate of the Cooper Union School of Art and Engineering. 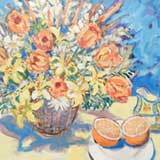 Professional affiliations include the Lyme Art Association, the American Society of Marine Artists (ASMA), Rowayton Arts Association, the Art Society of Old Greenwich and the Greenwich Art Society, where she has earned various juried awards. Yasemin Tomakan’s paintings have been exhibited in galleries in Nantucket, MA, Annapolis, MD and Darien, CT, as well as in Southampton, Long Island, and Rye, NY.